to the Vocant maps, which is to say good stuff in this style. Basically only two routes exsist, one over the drawbridges and and around the side of the castles, and under the drawbidges and around the back of the castles. The castle's wild lines extend inside to the flag rooms and into a cool cave to launch your Redeemer from. Bots do fairly well, but the recommended player load of 12-16 felt cramped. 8-10 allowed decent weapon coverage and enough company. Only play this at its max with ppl who know how to make use of the sniper post in the towers. Other mentionables: SoundFX also plays a nice role throughout, good tones and locations. The only thing I could see out of wack was the clouds racing by a bit fast. Overall it will be the extreme visuals that win this map a place on my hard drive. Well done TAZ, and keep up the excellent work. I like this one a lot. A fun, exciting theme. We need more original maps like this. Great Map !! When I first saw it's cartoonish looks I was put off a bit, but thankfully, I had to download it as part of a server rotation. The attention to detail, the bats squeaking, the bridge creaking & the spooky ethereal SFX make for a brilliant & welcome change for what would otherwise be 'Just Another Castle' map. Vid G�ran Perssons flint! (sweden) This map rules..Another favorite, and I ain't joking! One of the coolest castle map ever! Nice moon! Fun map with a unique look. I would have given this an 8, but there is a nasty BSP hole on a stairway going down near the flag room. It's very noticeable sometimes. Oh my GOD! Everyone at Nali City likes this map! (whimpers) Hold me mommy, I'm scared! This map is better than some of the CTF's that came with UT. There is something for everyone in here, but you have to actually earn what you want. Incredible bot action on Max Load, Adept and up, beautiful map! Are we even allowed to Agree? Great map. 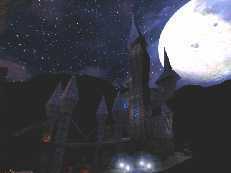 �Anyone knows another gothic or medieval CTF map similar to this one or Vandora? One teaching point for the author: Place a damaging zone under the whole thing. Now, when someone is shot off the map, they fall to death, but if they have the flag, it just stays there for a while.